X-Day 2 (エクスデイ2, lit. 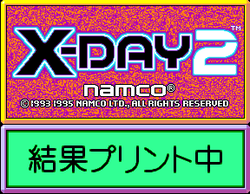 Ekusu-Dei Tsū), is a quiz arcade game that was released by Namco in 1995 only in Japan; it was the last game to run on the company's NA-1 hardware, and as the name implies, it is the sequel to X-Day, which was released two years earlier. However, as with its predecessor, not much is known about it (apart from the facts that it utilized two eight-way joysticks and two buttons as evidenced by the photograph of its cabinet below) - and even though it is emulated in MAME, it is the only one of the eleven Namco NA-1 games that is classed as not working properly and is unplayable. This page was last edited on 29 November 2014, at 10:45.